I am a terrible meal planner and the worst impulse buyer. I am that woman that wanders the grocery without a plan until I see something that sparks interest. Recently I was at my local chain store and was surprised to find the most beautiful savoy cabbage and knew instantly it had to go into my cart. 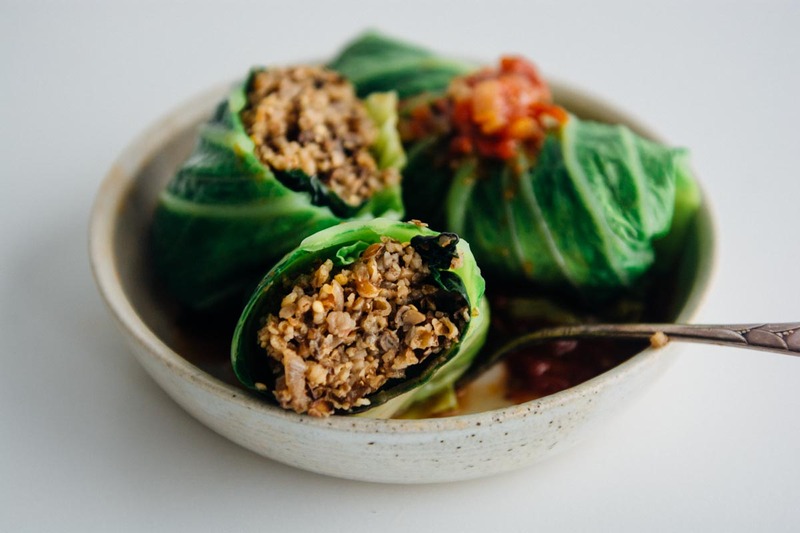 This recipe for vegan stuffed cabbage rolls developed as a need to use said cabbage, but I have to say that I loved the results. The filling is a combination of eggplant, mushrooms, onions and bulgur but it gets a huge boost of flavor with some added red miso paste, soy sauce, and liquid aminos. 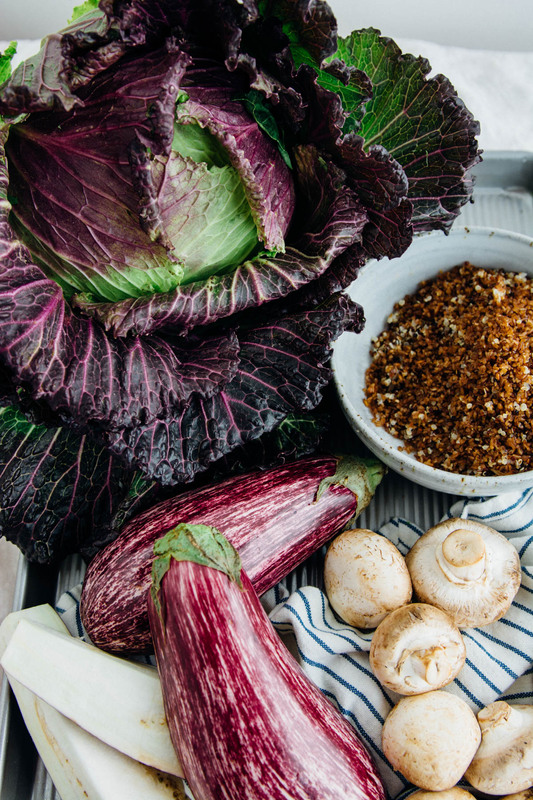 We have been avoiding eating any processed foods, and it has been pretty simple, just requires some planning and a bit of effort ahead of time. 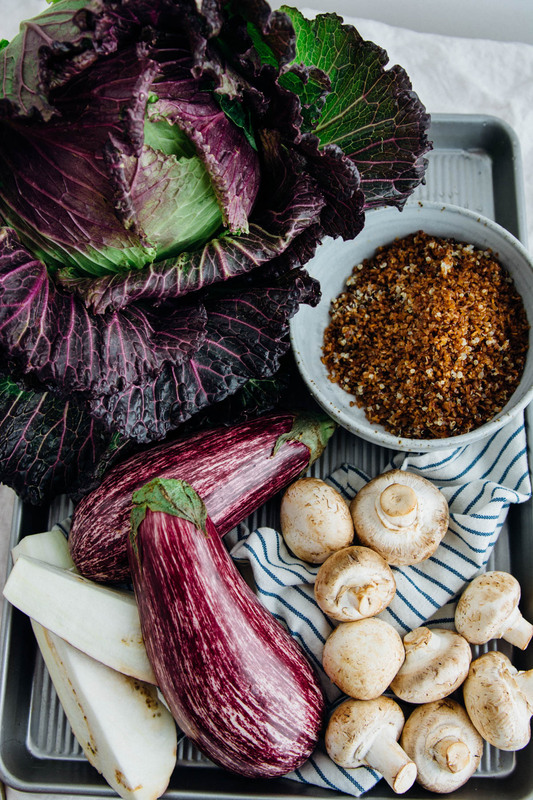 One or two days a week I cook up a huge batch of grains, vegetables, and protein, pack them into containers and lunch or dinner can be mixed or matched as desired. I’m planning on sharing my approach to meal planning once I dial everything in a bit more. I’ve found the biggest obstacle for eating well is a lack of preparation. 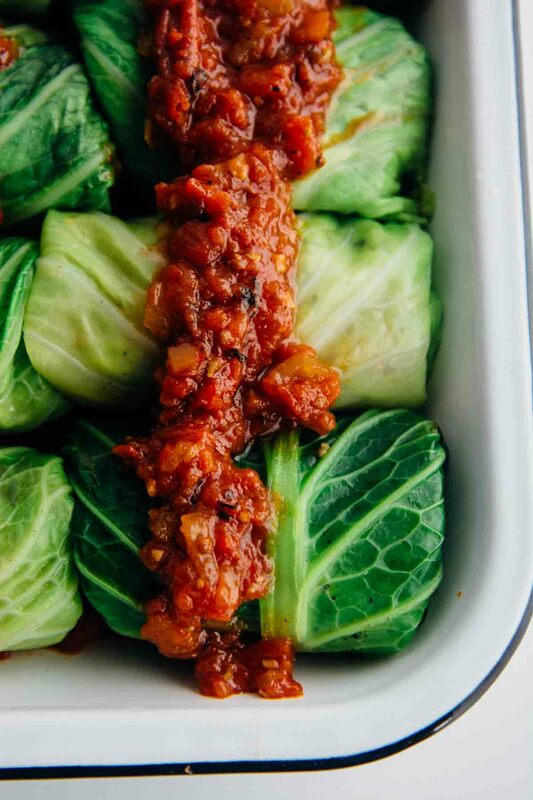 Cabbage rolls can be a bit labor intensive, but if you do a little planning, they come together quickly and easily and make a great freezer meal so a double batch may be in order. 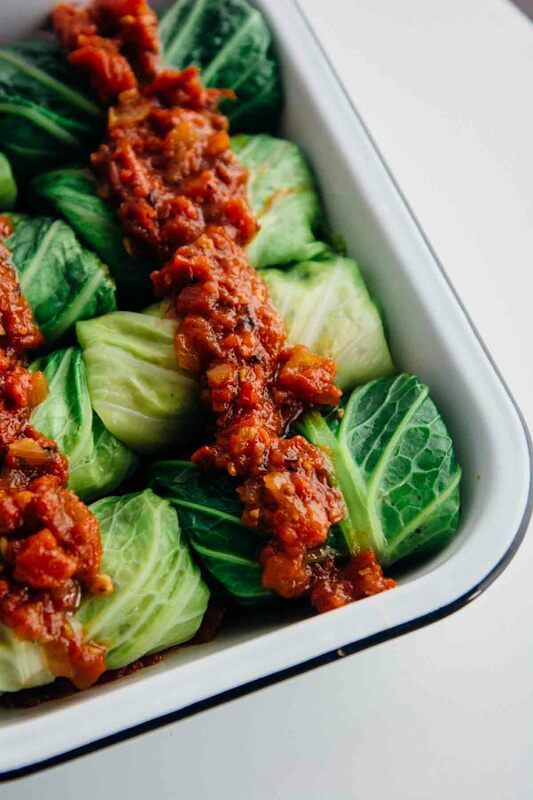 Blanching the leaves before stuffing makes for easy rolling and a quick tomato sauce can be bubbling away while you prep the filling. This recipe is a great Sunday afternoon cooking project. Alternatively, the filling in itself has been a genius find. I’ve made the mushroom and eggplant pilaf and just piled it on top of some thinly sliced kale and cabbage dressed with olive oil and lemon juice. Since prepping the cabbage leaves can be a bit confusing, I made a video that walks you through step-by-step. 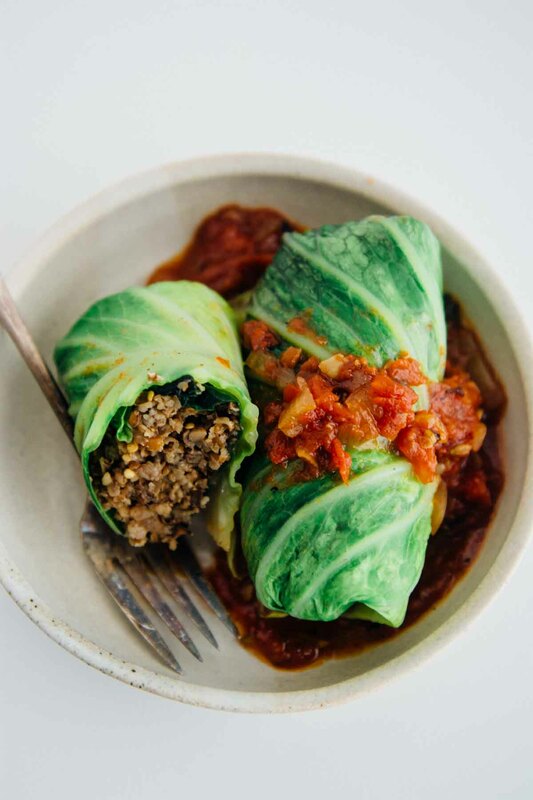 These vegan stuffed cabbage rolls are filled with mushrooms, eggplant, bulgur and topped with a quick tomato sauce! Dairy-free and freezer-friendly! Add 1 cup bulgur to 2 cups cold water. Bring to a boil; cover and simmer for 12 - 15 minutes or until tender. Drain off any excess liquid. In a large skillet heat 1 tablespoon olive oil and add the onions. Cook over medium heat, occasionally stirring until the onions have softened slightly and start to take on some color. Add the mushrooms and eggplant to the pan and cook for 6-8 minutes until all the liquid has been released from the mushrooms and vegetables start to take on some color. In a small bowl, combine the miso paste, liquid amino, and soy sauce and stir well to combine. Add the mixture to the pan and cook for another 1-2 minutes. Stir the reserved bulgur, mix and heat the mixture through, taste and add a pinch of salt and pepper if desired. To make the tomato sauce, heat the tablespoon of olive oil over medium heat and add the onion, garlic, salt, and pepper and cook, stirring frequently until the onions start to soften about 3-4 minutes. Add the wine and cook for 1-2 minutes and then the tomatoes. Bring the mixture to a simmer and cook until slightly thickened, about 10 minutes. Fill a large pot about halfway full with water and bring to a boil. Prepare an ice water bath by adding a few cups of ice to a large bowl of cold water. Peel off one of the large outer leaves of the Savoy and cook for 1 minute and then immediately transfer to the ice bath. Repeat the process until you end up with 8 blanched leaves and maybe one or two extra for good measure. 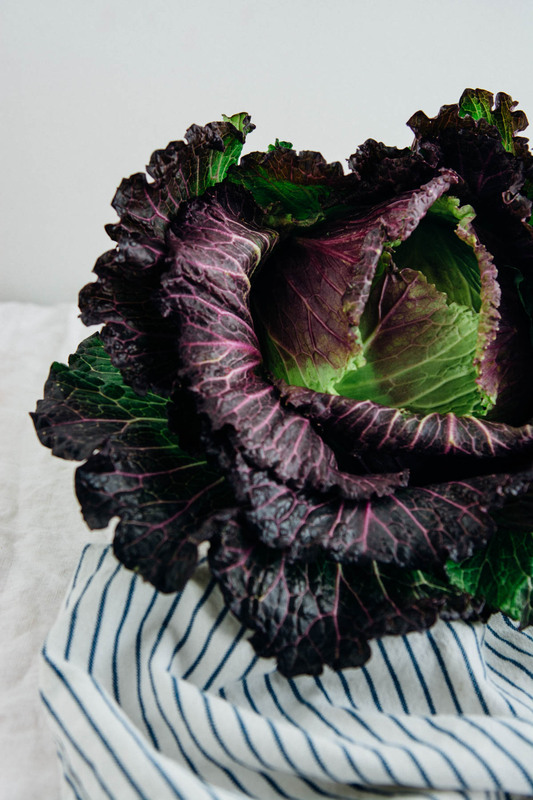 Using a small paring knife trim the tough inner stem of the cabbage leaf by running your knife horizontally along the stem, you are basically trying to level the surface and make it easier to fold. Pre-heat the oven to 350 degrees. Spread 1 cup fo the tomato sauce in a 9x13 baking dish. 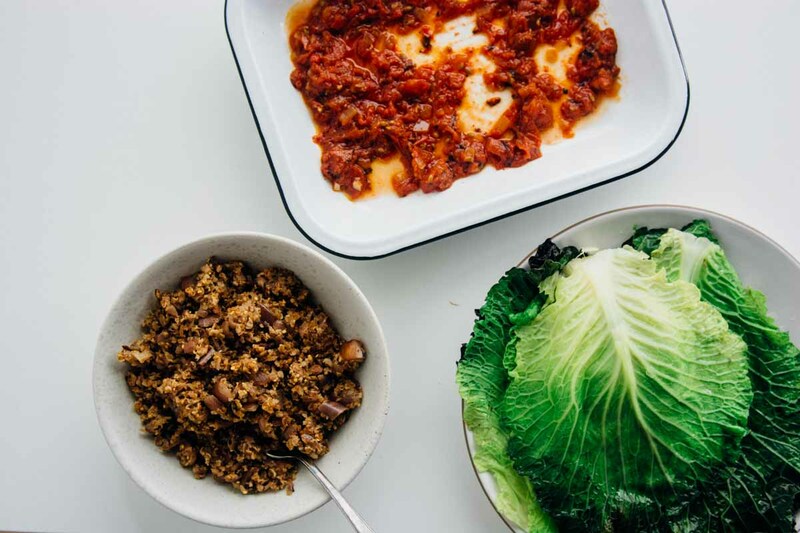 Place a cabbage leaf on a clean surface and spoon about ¾ cup of the bulgur mixture on the top third of the leaf. 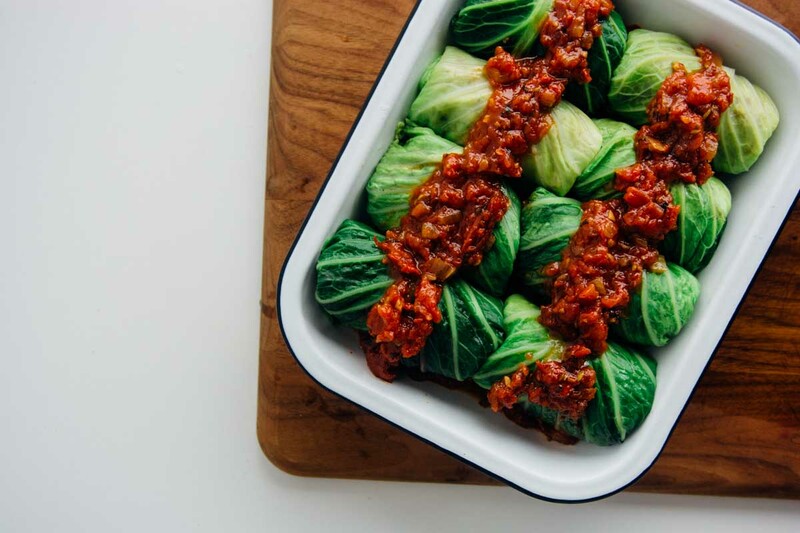 Fold the top down over the filling and then tuck both sides of the cabbage towards the center and then roll the cabbage tightly forming a little bundle and add to the baking dish seam side down. 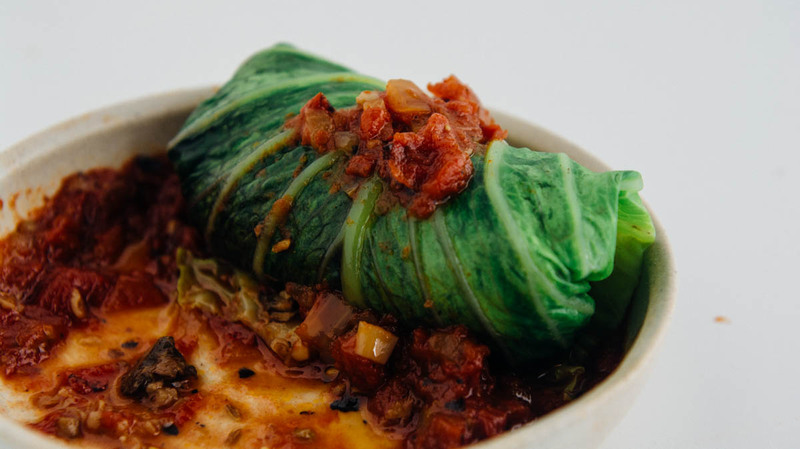 Repeat with the rest of the cabbage leaves, top with the remaining tomato sauce. Bake, uncovered until hot and the leaves are soft 30-40 minutes. You can prep everything a day ahead and store covered in the fridge reserving the final bake until 30 minutes before serving. Do you suppose that I could sub in red quinoa for the bulgur to make it gluten-free without any drama? I should think so, but wonder if you think anything to the contrary? P.S. I am making your wonderful Persimmon-Cardamom-Pistachio-Yogurt affair (our immediate family favorite) for the greater family Thanksgiving celebration. I thought it would make a nice addition to the ubiquitous pie! So sorry for the delayed reply. 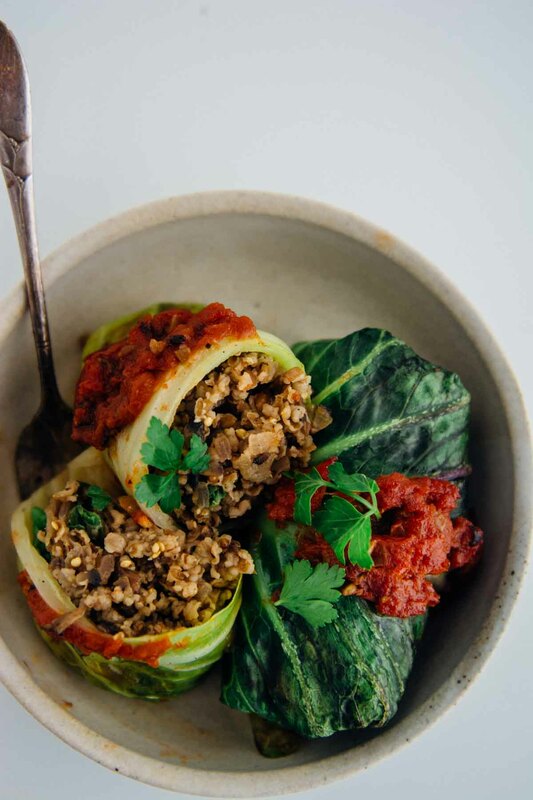 You could definitely use quinoa instead of bulgur in the cabbage rolls, I think it would work wonderfully! Let me know how it works out for you if you decide to try it! I am so excited that it is persimmon season, I’m hoping to have a new recipe to share with you soon!